Mamma Agata Cookbook 5th Ed.! Bring Italy and Mamma Agata into your home!!! 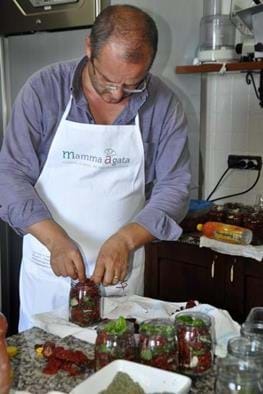 Finally…Mamma Agata’s extra Virgin Olive oil!!! We've had a BEAUTIFUL and long summer this year... so sunny and hot!!! The tomatoes LOVED it... and the harvest was AMAZING!!!! 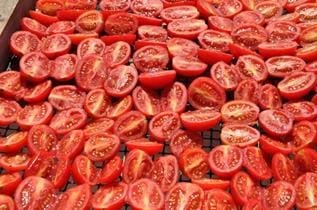 What do you do with sooooooooooo many tomatoes? 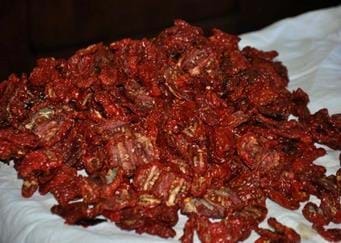 Make sun-dried tomatoes of course!!! 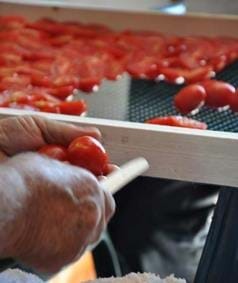 First Gennaro and Papà Salvatore must harvest ALLLLLLLLL the tomatoes and then wash them very well. 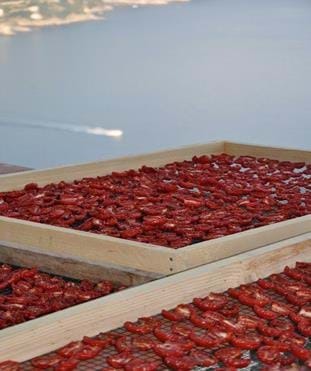 It's so much work when it's burning hot outside... but all winter long we will thank them as we enjoy the sun-dried tomatoes!!! Papà Salvatore is soooooo patient! 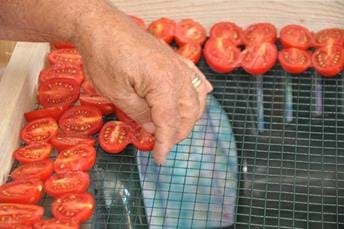 He cuts each one of the tomatoes open and lays it out on the drying racks with the cut side up. 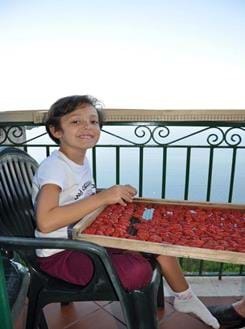 Of course there is always help from family and Papà Salvatore's good friend Giovanni!!! 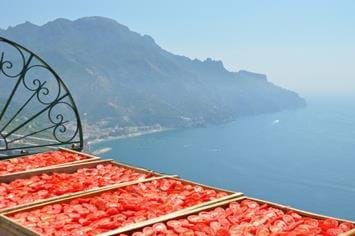 They line up the tomatoes in rows to fit as many as possible on each drying rack. When the trays are filled, it's time to start another!!! 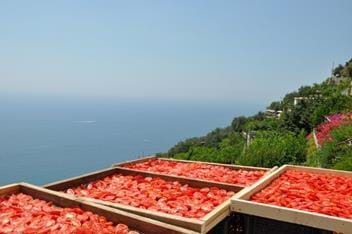 When the trays are ready, they are placed out in the sunshine to dry. With this heat, it didn't take long!!! 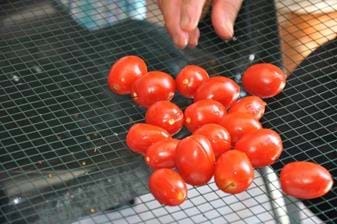 We watch them all the time... and when they are dry enough on the top to turn over without spilling out any juices... each tomato must be turned over to dry on the other side. 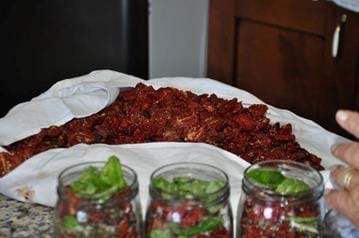 It takes SOOOOOOO much patience to make sun-dried tomatoes, but it's worth it!!!! 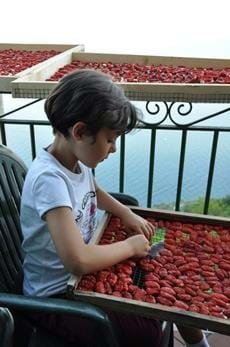 Papà Salvatore loves having time with his granddaughter Paola... who loves to help turn over the sun-dried tomatoes!!! She's such a hard worker!!!!! 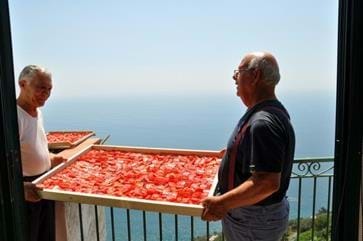 And then the tomatoes are left to dry out on the other side... until Gennaro pronouces them... perfect!!!! 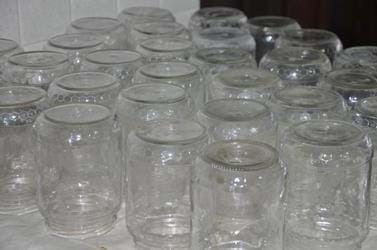 Now it's off to the kitchen where the jars are cleaned and sterilized and ready for the next step!!! 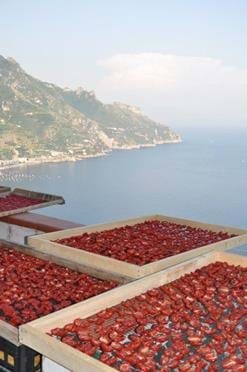 The sun dried tomatoes ready to be canned!!! 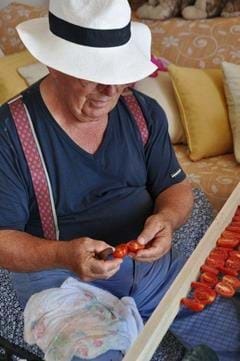 Gennaro harvests and cleans fresh basil from the garden and prepares our own garlic to be layered in the jars and then topped with oil! We also include capers and a pinch of oregano! Aren't the colors divine???!!! 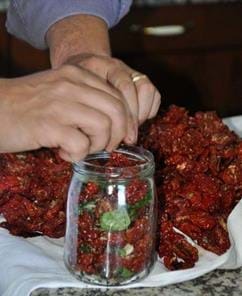 Preparing the jars of sun-dried tomatoes!!! 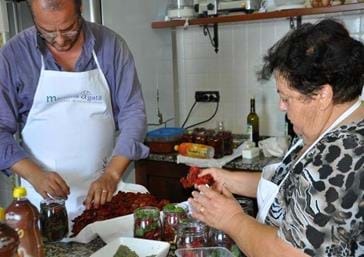 Mamma Agata and Gennaro work side by side to fill the jars with sun-dried tomatoes and capers and garlic and basil... yum!!! 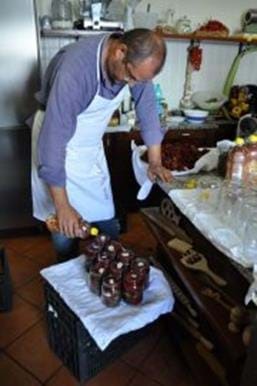 When they are all ready, Gennaro fills the jars to the top with peanut oil, and then they are ready to be sealed! 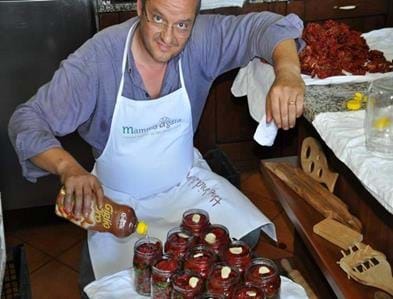 When they are all ready, Gennaro fills the jars to the top with peanut oil, and then they are ready to be sealed! One last touch... a clove of our own fresh garlic on top!!! 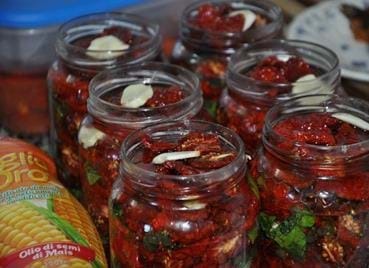 The jars of sun-dried tomatoes are ready to be sealed!!! 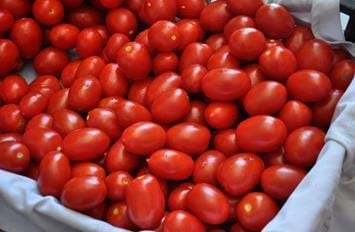 We also make a special selection of sun-dried tomatoes with corn oil instead of peanut oil for sharing with our friends that may have nut allergies!! 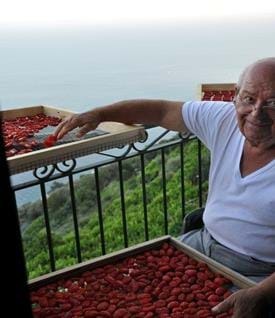 Another wonderful year of sun-dried tomatoes... thank you to Gennaro, Mamma Agata, Papà Salvatore, Paola... and everyone who helped!!!!!! Please, send us an email for the complete prices list. 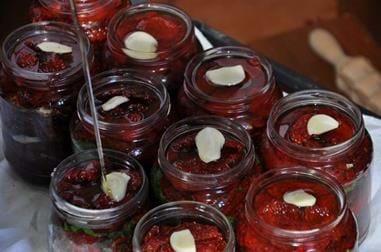 To order Mamma Agata's Products as a present or to simply treat yourself, please, send us an email at Contact Us with your request! We ship all over the World and we will be happy to customize your order! Please, note that all cost are NOT inclusive of shipping fees.